This Holiday Season I'm also honored to be participating in the annual event Raging Art On at Gamut Gallery in Minneapolis, MN! I'm so excited to present this one-night exploration of two artists’ internal processes through fine art and movement. Parking on Dayton Ave. Entrance through alley at Dale Ave. Wine and refreshments provided but always open for BYOB. It's going to be an incredible event! I'm elated to be a part of this fun concept show at Covet Consign. Covet selected 10 artists to contribute work that illustrates the concept of Rhythm as a visual element. I have one piece entitled Solo in this exhibit! Head over to Covet and check out these Rhythmic works. I'm so honored to be a part of this amazing group of Alums. This show is sure to be amazing! Opening Reception: Saturday, February 4, 6-8 p.m. 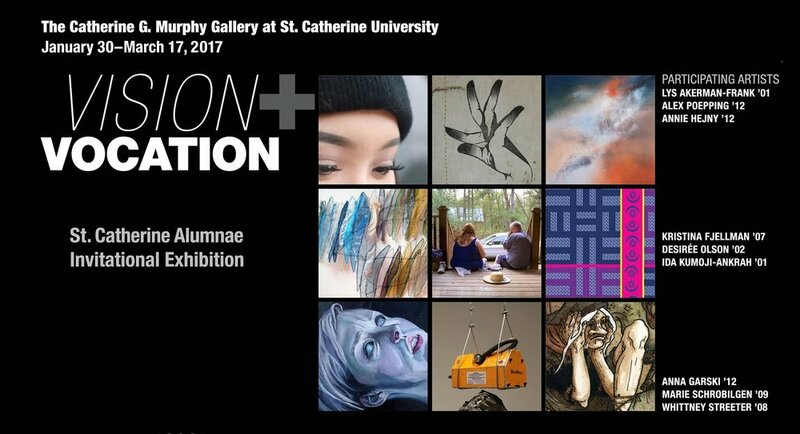 The Catherine G. Murphy Gallery at St. Catherine University opens its winter exhibition season featuring the work of nine alumnae of the studio art program at St. Kate’s. Using a variety of styles, media and methods, this diverse group of women carries the vision of their artistic endeavors into their professional and everyday lives. Stop on by Covet on November 17th from 6-9pm for the Annual Under $100 Art Show! I'll be there along with 4 previously unseen pieces for sale! Not to mention 24 other artists with amazing work all available for under $100. Over my busy Holiday Sale filled weekend a short notice show popped up! My artwork will be on display at Glam Doll Donuts in Minneapolis until the end of January! Stop by for some donuts (yummmmmm) and check out my artwork!!!! Keep in mind too that several pieces are still shown at Covet Consign and Design in Minneapolis until the beginning of February! Lots of stuff going on and lots of stuff in the works so stay tuned! Hey Everyone! Along with the Covet Holiday Show and the Art Inspired Music project mentioned in my previous post, I will also have art available for sale at two other Holiday Events! I will also have pieces available along with many other artists on Sunday December 14th in the Carleton Artists Lofts in St. Paul! This event will be going on from 12-6pm and we'll have plenty of treats and a variety of mediums for you to take a gander at! Get your Holiday shopping wrapped up at one of these great events! Stop on by to some or all of these great events! Hope to see you all there! Some shows on the horizon! In December Covet Consign & Design will host their annual $100 and under Holiday Show! Stop on by from December 11th to January 4th (Reception on December 11th 6-9pm) to shop for some affordable art and decor! My work will also be featured in the Art-Inspired Music Project at McNally Smith College of Music from February 24th until the end of April! This is an amazing show where a musical piece is created for each artwork by a different composer at the College! Check out this VIDEO for more information from last year's show and stay tuned for more info! So excited for this one!!! Show at Kopplin's Coffee in St. Paul! I'll be showing my most recent collection at Kopplin's Coffee in St. Paul from July 1st - August 17th. Please stop by the reception July 18th 6-8pm! An extension of my most recent collection exploring esotericism, this collection, entitled Residual, digs even deeper, delving into the objects of ritual and spirituality and in doing so, the people who use them. I seek now not only to create esoteric icons but to produce evidence of ritual and the occult. Combining scientific, spiritual, nostalgic and architectural imagery, these relics will draw the curiosity of the viewer while excluding them from their true meaning and origins. Shifting between figural, abstract and still life representations, all of the compositions seek to alienate the viewer from the exact use while giving just enough clues to rouse suspicion. By portraying the artworks as relics I attempt to show ownership, past use and reverence while not revealing the exact importance. Spotlighting the touch of the past owner or ritual overseer I draw inspiration from spiritual architecture, Indian classical dance, catholic relics and the treatment of objects with historical significance. Plenty of framed and unframed work will be available for Art-A-Whirl 2014 at the Casket Arts Building in Northeast Mpls! Stop by my table Friday May 16th 5-9pm, Saturday May 17th 12-8pm and Sunday May 18th 12-5pm to browse some prints! Here's an update of some upcoming shows I'll be doing in December! I'm this Thursday's (4/11) featured artist over at Covet Consign and Design on 38th and Chicago in Minneapolis! I'll be showing artworks from my latest collection exploring the concept of esotericism. Come on down and enjoy some new linocuts, awesome home decor and some delicious treats!